The IE2EI course provides professional development rich in resources to help the industry expert develop a successful learning environment. Most of the materials are practical and presented in a manner that will allow instructional new comers immediately incorporate proven adult learning concepts into their courses. In this module participants will be introduced to four concepts expected of quality teaching in higher education. Participants will be introduced to planning a course with three main goals: identifying who and where the students are entering the program from, clearly articulating what students should be able to accomplish at the end of the course and how to ensure students are progressing toward mastering the course learning outcomes. In this module participants will be introduced to best practices in creating a course syllabus. 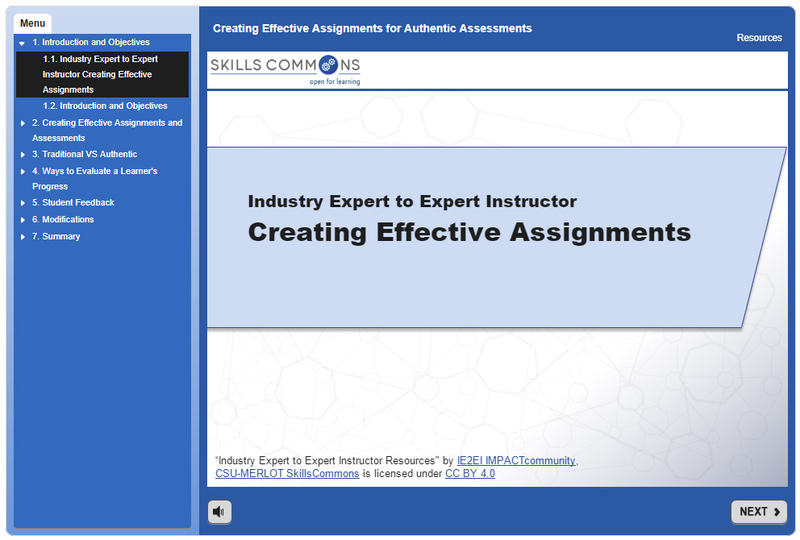 Use of the content of this module will help participants create syllabi which help students understand the framework of the course, assess readiness for learning the contents of the course and finally allowing the student to effectively process information required to complete the course. 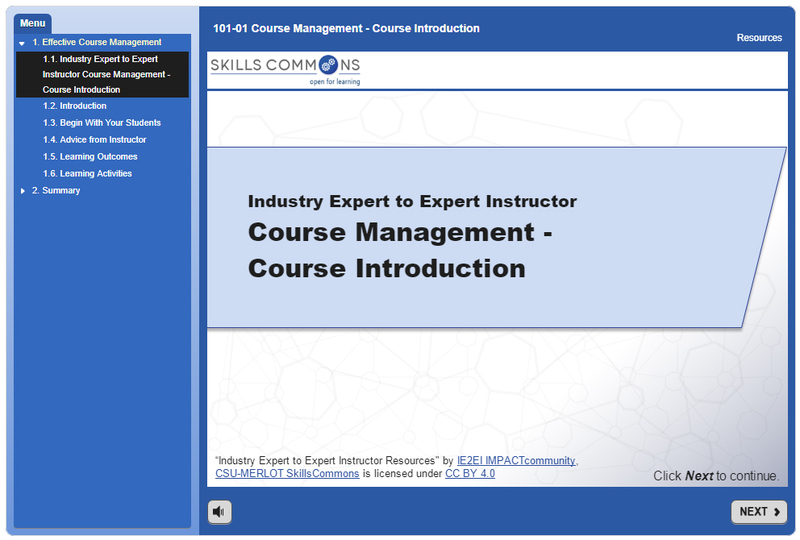 In this module participants will be introduced to the types of course management tools available when instruction occurs in a learning management system. Participants will gain understanding of how to use the learning management tools of interactive resources, online participation tools, and sequencing of course content. in creating a course syllabus. Use of the content of this module will be dependent upon your institutions requirements for use of a learning management system. 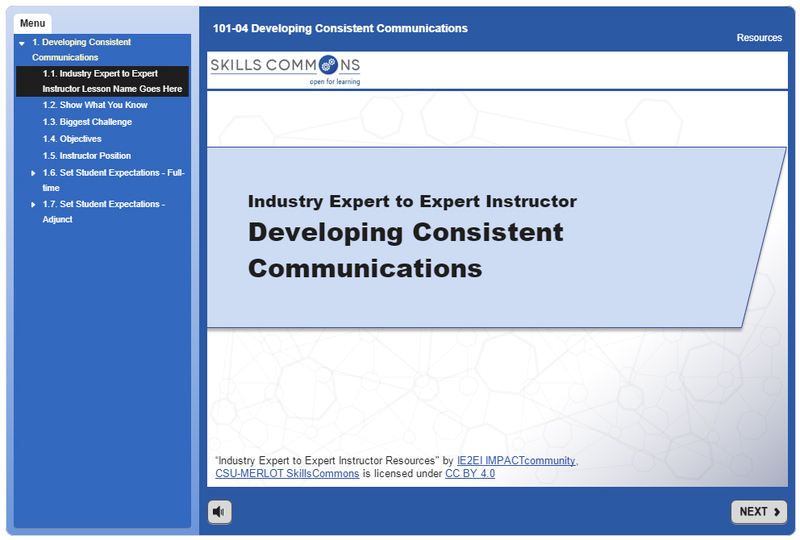 In this module participants will be introduced to communication best practices in interacting with students in your course. Topics covered include setting communication expectations to ensure consistent communication, improving communication between you, how to communicate engaging students, independent of their learning styles. In this module participants will be introduced to student learning competencies and outcomes. By completing this module, you learn best practices in determining outcomes of the course, select assessment that will accurately measure student learning, plan lessons that will scaffold learning opportunities, and map your course to ensure student learning opportunities match the learning outcomes. In this module participants will be introduced to Benjamin Bloom and his theory of how a brain learns. Content includes a quick overview of Bloom’s Taxonomy and the hierarchy of learning. Best practices will be shared to challenge your students to process learning at the highest possible level on Bloom’s Taxonomy. In this module participants will be introduced to tools to help foster student learning. Topics include encouraging student self-responsibility towards their learning, encouraging active learning, creation of logical grading systems, and ensuring student success with effective feedback. In this module participants will be encouraged to establish a course climate which fosters learning. Best practices include managing tempo and timing of lessons, creating opportunities to connect students to the instructor and opportunities for student to connect to other students. Included in this module are resolving negative behavior impacting student progress. 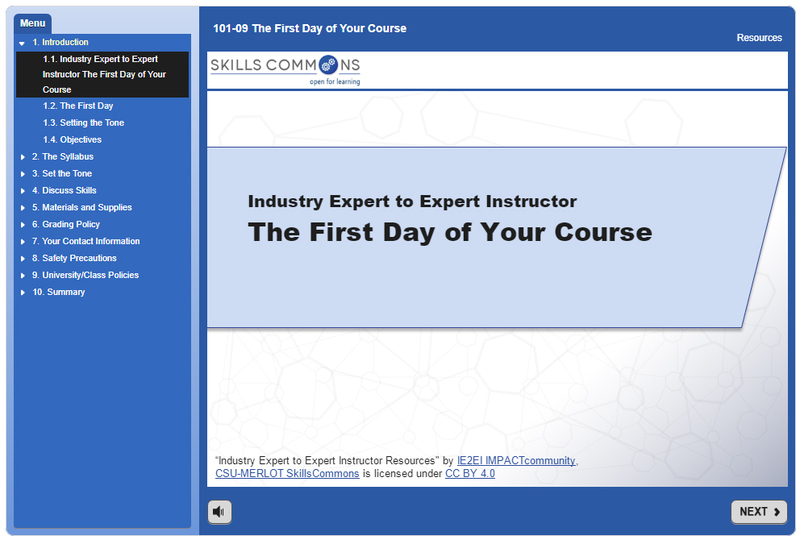 In this module participants will review how to prepare your students for success on the first day of the course. Topics covered include setting the tone of the course including behavior expectations, prerequisite skills expected prior to starting the course and a general overview of the scope and sequence of the course Additional information contained includes ensuring student understand what is expected of them by reviewing policies of the institution and polices specific to your course such as grading, communication, and safety. In this module participants will learn techniques to foster development of students’ intellectual reasoning and problem-solving skills; how to address different learning styles of all students, create a course environment which encourages independent thinking and perseverance in overcoming barriers to learning. In this module participants will identify ways to engage students in active learning and incorporate active learning in your course. Participants will also learn the difference between andragogy and pedagogy and how to use active learning to encourage to take an active role in acquiring knowledge, skills, and abilities within your course. In this module participants will be exposed to different ways to assess student progress. Topics covered include creating effective assignments and assessments, traditional verses authentic assignments and assessments, and providing effective feedback for student learning. 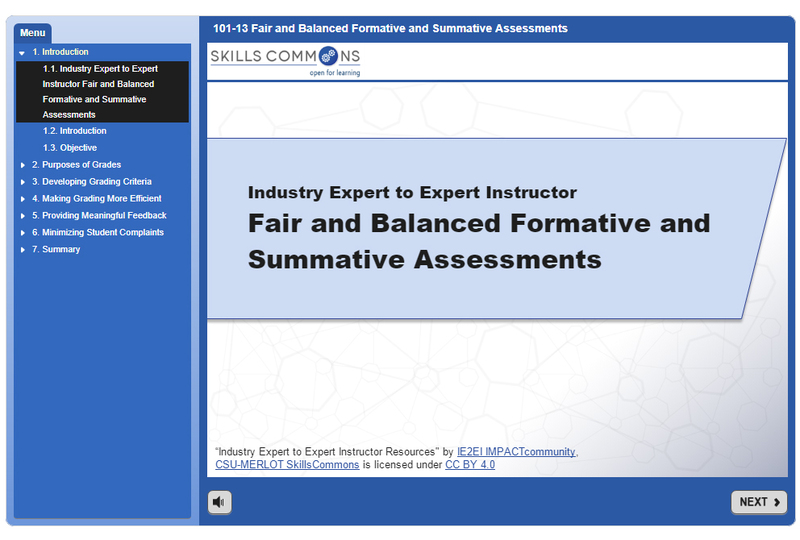 In this module, participants will develop a deeper understanding of the different types of assessments needed to monitor student progress and how to accurately and efficiently grade student work. Grading criteria and rubrics are discussed along with minimizing student grade complaints with detailed assignment instructions, transparent grading criteria and meaningful feedback.